When it’s time for your next oil change in Oakville, consider dexos1™ Synthetic blend oil. The new dexos1™ General Motors oil specification is raising the bar by providing a high quality synthetic blend of engine oil designed specifically for the performance of General Motors vehicle engines. dexos1™ represents state-of-the-art engine oil technology, providing performance more commonly associated with costly premium or full synthetic engine oil. 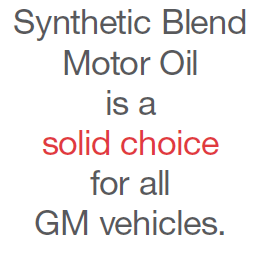 ACDelco Synthetic Blend dexos1™ motor oil is a “Better” entry in GM’s Good Better Best product portfolio and is meant to fit between conventional oil grades and full synthetics, giving you more ACDelco oil choices than ever before. The new oil has been developed to help keep engines cleaner, improve efficiency and maximize engine life. The dexos1™ specification will also simplify oil selection by providing a single specification that you can look for and rely on. Keep your car running cleaner and longer; schedule your next oil change with Budds’ Chevrolet and request ACDelco Synthetic Blend dexos1™ motor oil.